The outcome of the US midterm elections is unlikely to change the course of Washington’s North Korea policy but could slow the pace of the Donald Trump administration’s diplomacy with North Korea, experts said Wednesday. 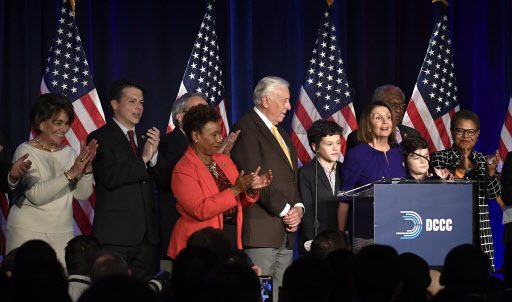 The Democrats regained control of the US House of Representatives, where they will seek to keep Trump’s agenda in check, while the Republicans maintained their majority in the Senate in Tuesday’s midterm elections. The Democrats have traditionally advocated engagement with the reclusive state and sought to resolve the North Korean nuclear crisis diplomatically -- the same direction the Trump administration has taken to achieve the “final, fully verified denuclearization” of North Korea. However, the Trump administration’s engagement with the North could come under tighter scrutiny by the Democrat-controlled House, experts say, given that it has subpoena power and control of key committees. James Kim, a research fellow at the Asan Institute for Policy Studies, said Trump administration officials will likely be distracted by a range of issues raised by Democrats. “In terms of the North Korea-US issue, the Democrats also want a diplomatic solution. The difference between the Democrats and the Republicans would be how they pursue the diplomatic solution to achieve their goal,” Kim said. North Korea and the US are engaged in negotiations to rid the Korean Peninsula of nuclear weapons in return for corresponding measures by the US. Pyongyang has increasingly called for the easing of economic sanctions against it. Woo Jung-yeop, a research fellow at the Sejong Institute, noted that the US House could call in US diplomats for hearings, investigate Trump’s North Korea policies and demand more details about the Trump administration’s negotiations with the North. “The North Korea policy won’t change, but there will be tighter oversight by the Democrats, which could involve more hearings and more investigations. It means that there will be many more restrictions on what Trump has been able to do his way,” he said. Democratic Rep. Nancy Pelosi of California, who is poised to resume her role as the speaker of the House after eight years in the minority, pledged a new era of “accountability” in a speech. Woo also pointed out that the Trump administration will face growing pressure to take issue with North Korea’s human rights record, which could further complicate Washington’s denuclearization talks with Pyongyang. Washington says it takes North Korea’s human rights abuses very seriously, but that now is the time to focus its efforts on getting North Korea denuclearized. North Korea sees other countries raising the issue of human rights as a challenge to its sovereignty. “The midterm elections created a tougher environment for the Trump administration to offer concessions to Pyongyang without tangible progress on denuclearization,” Woo said. A tougher US stance on North Korea could complicate South Korea’s efforts to improve relations with North Korea and expand cross-border exchanges in line with progress on the denuclearization of North Korea.